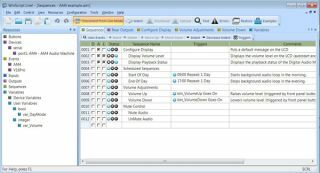 Alcorn McBride has released a new version of WinScriptLive!, the programming tool for its Pro line of show controllers. Customers can now download the latest version of WinScriptLive! at www.alcorn.com/support/software.html. WinScriptLive! is a software tool that provides easy-to-use sequence and event programming. It now has a refreshed look and enhanced navigation with additional features such as a new resources view, drag-and-drop functionality, new V16Pro/V4Pro events, and additional internal variables. This release includes new example scripts and a Product File Creator tool. WinScriptLive! supports a wide range of Ethernet protocols and provides support for unsolicited incoming messages. Users can modify scripts while running in “Live Mode” and all of the files necessary to run a show - including touchscreen configuration files and artwork – are stored on a CompactFlash card in the controller for easy retrieval and editing.